When a good question in our Christian teachers' Facebook group started garnering comments about religious tolerance and how we are all worshipping the same God, I figured it was time we talked "face-to-face." Here's the recording of the resulting Facebook live, where we talk about the only way to God, tolerance, and what all this means for us as Christian teachers. We are so thankful to have many Muslim teachers with us a Teach 4 the Heart, and I hope this message will not make you feel unloved or unwelcome. We care for you deeply and hope these thoughts make you think and consider the claims of Jesus for yourself. Jesus claimed to be God, so He cannot simply be a "good prophet." He was either a liar, a lunatic, or exactly who He claimed to be: the son of God and the only way to Him. If you'd like to consider these things together, please reach out at linda@teach4theheart.com. You may also find this video helpful: https://www.youtube.com/watch?v=jMdQKFTEAyc. Did you find this video helpful? Clue in your fellow teachers by sharing the post directly (just copy the URL), clicking one of the buttons to automatically share on social media, or posting one of the images on Instagram or Pinterest (click on the image to save). This was prompted by a conversation that was happening yesterday and today in our Facebook group. The conversation was a really interesting question, but it prompted a discussion with a lot of great comments, but some concerning ones too, and it was just reminding me, this is not the only time I've seen these concerns. I think there's a lot of confusion amongst Christians and Christian teachers about some of these things, and so, like I said, I feel like I have to say something and try to clear up some of these disagreements, concerns, whatever you want to call them. So, here is the question that was originally asked. It was actually a really good question. A teacher said, "I had a Muslim student that came into my class and asked if she could use my room. I think no students were there. It was just her and the student. And I said 'Of course,' and I didn't realize this, but I looked back, and she was actually bowing down and praying, you know, praying, because that's what she was supposed to do. And I was like, oh, it didn't bother me, it just took me by surprise, and so I'm wondering, you know, what should I do? I just want ... I want her to know that I'm a Christian. I'm not quite sure what to say or how to handle this." And most of the advice was great. I think the overwhelming answer to the question was, "Of course, let her use your room. Show love to her in that way, and you can hopefully, maybe you can even ask her a little bit about her faith and have an opportunity to open doors of conversation," which was great. But as we were having conversation in the comments, there were a lot of different comments, and some concerning comments. And some of the ones that really concerned me ... so this is not isolated to this conversation, these types of comments I see all the time amongst Christians, and that is things like, "Well, we need to tolerate all religions," and "Her belief is just as valid as our belief," and, "What would you want..." just things like this, basically, you know, "It's the same God, so it doesn't matter." And here's the thing. There's pieces of truth in all those statements, but I'm just really concerned about a few things. And so I'm gonna share three things here. We're gonna start with a big truth, and then we're gonna talk about tolerance and what that means, and then we're gonna really narrow it down and talk about what that means for us as Christian teachers. I'll try to make this quick. Big truth, what is tolerance, what does that mean, and then what do we do with this. So, first, big truth. 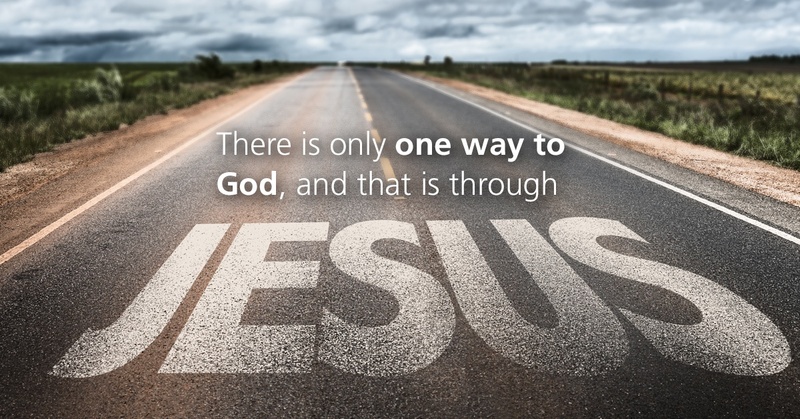 There is only one way to God, and that is Jesus. That's it. There is only one way to God. And if you consider yourself a Christian and you don't believe that, I challenge you to read the Bible. I challenge you to really consider these things. Read the Bible for yourself. Listen to messages and preaching. I'd recommend Truth for Life. You can Google that. I'll try to leave a link later. And really consider this, because listen, here's the truth, the Bible says ... Jesus said, "I am the way, the truth and the life. No man comes to the Father but by me." The book of 1 John says over and over, "If you don't have the Son, you don't have the Father either." And so there is only one way to God. The Bible is crystal clear about that, and we need to know that for ourselves, but we also cannot lose sight of that truth. Our society is very pluralistic, meaning they want ... we are constantly being told that all ways to God are equally valid, that your truth is good for you and my truth is good for me, and we can all have our own truths. But that's not what the God of the Bible teaches. That is not what is true. There are not many truths. There is one truth. There is one way. 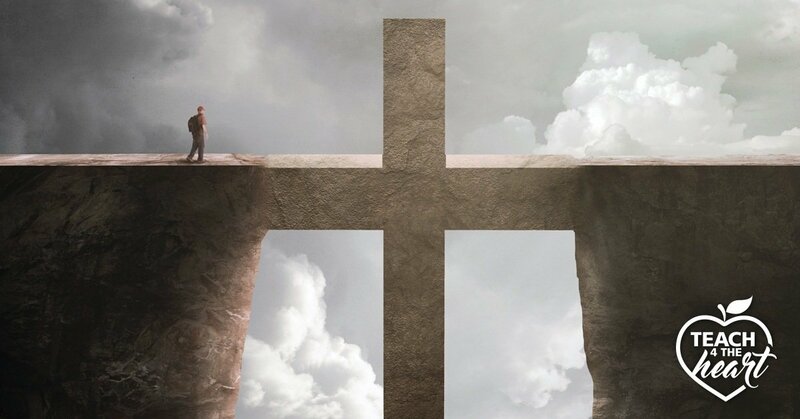 There is only one way to God, and that is through Jesus. So, we can't ever lose sight of that. We have to know that. We have to believe that. And like I said, if you don't believe that, I challenge you to read the Bible for yourself and consider these things for yourself. Consider if there really can be, if all of these really can be equally valid. And consider that if you're just depending on the way you were raised or what you feel or what you think, where is the surety in that? How do you know that you're right? So, there's that. Before I move on to tolerance, let me just be really clear here about what the Gospel is, what the Bible says about how to get to God. The Bible says, the Gospel is that God created us in His image, good and perfect. But, that Adam and Eve, in their sin, when they disobeyed God, they brought sin on us all. So now we are not born good. We are born in God's image, but we are each born with a sin nature, and because of that sin ... in other words, we by nature don't want to have anything to do with God. We want to rebel against God. We don't want to come to Him His way, we want to do our own thing. So that's our nature. By nature, we're born that way, and because of that, we are separated from God. So our sin, our failure to meet His standards, we are separated from God. We cannot be with Him. But, God had a plan, and He sent Jesus, His son, the son of God, to be born of a virgin, to live a sinless life that we never could, and to take our place, He died on the cross in our place to do what we could not do, to reconcile us to God. And in His resurrection, proved that He was God, that He accomplished what He came to do, and that He is the only answer. And if God draws us to Himself and we respond by faith alone in His work alone, not in anything that we have done, then He will change our heart, He will renew our lives, and He will reconcile us to God in life and in death. So, that is just a very brief summary, but that is the Gospel. That is the only way to be reconciled to God. That is the only way to know God. No other way works. I say that because the word Christian is used so broadly, and even in our Facebook group that's for Christian teachers, I know there are so many different views on this, and I just want to challenge all of us to go to the Bible. 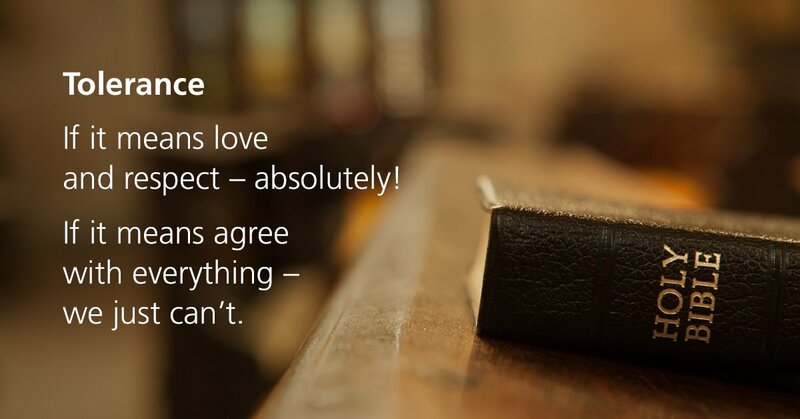 The Bible is the only thing we can trust in for sure. Not what you've been told growing up, not what you think, not what you feel, not what I think, not what I feel, but what the Bible says is what is sure ... and it says there is one way to God. There's only one way to God. That's the broad truth. Tolerance. Tolerance is the buzz word in our society. It is like the most important thing. Everything must be tolerated, except intolerance. So, should we be tolerant of other religions, other beliefs? Well, that totally depends on what you mean by tolerance, and I've found tolerance is not always defined. It's just thrown out there. So, I'm gonna define it two different ways. I'm gonna define it in a way that we should do it and a way that we shouldn't do it. If tolerance means that we love people, that we are there for them, that we go out of our way to help them, that we respect them as people made in God's image, that we respect their right to believe differently than we do ... if that is what tolerance is, then we absolutely should do all of those things. We must love people. We must go out of our way to help them. We must inconvenience ourself for their sake. We must, like I said, respect that they might think differently. If that is tolerance, then yes. But, if tolerance is believing or implying or outright saying that your way to God is just as valid as the Bible way to God, then we cannot be ... then that is not what we are called to do. We can't. We'd be lying. Lying for the sake of tolerance, I mean, I don't know, right? I mean, we can't do that. Like I said, there is only one way to God. When people throw out the word tolerance, I don't know if I should applaud or like, yell. I don't know, 'cause I don't know what they mean. So, that's the difference. Tolerance, if it means love and respect, yes. If it means agree with in all things, no. If it means say that their way is just as good as the Bible way, no. And I'm getting a little bit off on a rant here, but I think this is really, really important. And I will just give an example of I think what this looks like. So, I have a friend ... I have a lot of friends, but I have a friend in particular that I talk with a lot, and we believe very differently about God, about faith, and honestly about a lot of things ... like pretty much every political issue. We are on opposite sides, but we are friends. And here's the thing, we know ... we know that we disagree on these things, but we can talk about it very respectfully. We have these great conversations, and I learn so much from them. I hope she's learning from them. And here's the thing, I respect her a lot. I know she is searching for truth, and she's very intellectually honest in her search for truth, so I respect her, and I respect her right to believe differently than me. I don't really respect her beliefs. I believe she's dead wrong, but I respect her and I respect her right to disagree, and I love that we can talk about those things honestly. I love it. And we're friends despite, and maybe even because of some of these differences. But she knows that I think differently, and that I don't think that her way is just as good as the Bible way, that I really believe this is the truth. And honestly, I think she believes the same, right? She thinks I'm wrong, right? We can't both be right. It's just impossible, right? There either is a God or there isn't. We can't both be right. So, that's what I'm saying, all right? We can have both. We can love, respect, be friends with people, and we should, without implying to them that what they believe is right. I'm not saying that we should go up to them and necessarily just share this with everybody all the time, right? You've gotta be wise, you've gotta be sensitive to the Holy Spirit's leading, it's gotta be in the right context. So that's not what I'm saying, but I'm just saying never lose sight of the truth. And tolerance, yes or no depends on what you mean by that. 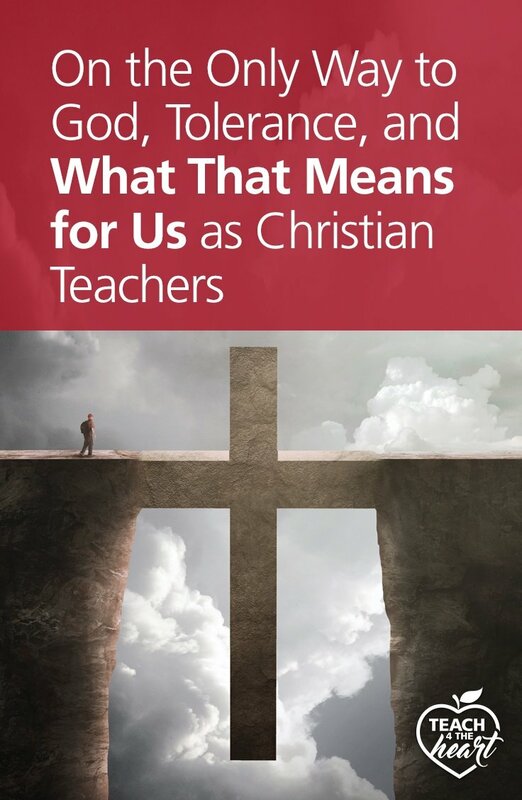 Finally, what does this mean for us as Christian teachers? I cannot say exactly what this means in your classroom. Well, I can say, if you're in a Christian school, you proclaim these truths from the rooftop. But if you're in a public school, you have a lot of restrictions on what you can and can't say, and honestly on maybe even what you should say. So, first of all I would say, know when it is and isn't appropriate to bring up religious topics. And if you don't know that, we have a training that can help you. It's called Teach With Faith, Not Fear. You could Google it and I'll try to leave a link here when I'm done. It's in partnership with CEAI, and David Schmus, the director there really is knowledgeable and he gives a lot of practical advice on when as a public school teacher can you talk about religion and faith, and when can't you. And maybe more importantly, not when, but how, like how are you supposed to talk about these things. So you need to know that. You need to know what is and isn't appropriate. But two other things. You also just never lose sight of the fact that there is one way, and that your students need Jesus. And whether or not you can ever say anything to them, whether or not you ever mention anything, don't lose sight of that. Don't get sucked into thinking, oh, they're good kids, they're okay ... or, well they believe in God, that's good at least. Just never lose sight of the truth, that they need Jesus. And then finally, just pray for them and listen to the Holy Spirit. Be sensitive to His prompting in that ... remember that it's God that draws people to Himself. If God is at work in their life, drawing them to Himself, that's His work, it's not ours. But sometimes He allows us to play a part in that, and that is such a privilege. So pray for your students and be sensitive to His leading. If you do feel God leading you to say something that is okay to say, that is appropriate, then be sensitive to that and be looking for those opportunities where God might allow you to play a part in His plan, and what a privilege, especially with our students. That's just awesome. So, I hope these thoughts have been a little bit helpful. Like I said, these things come up all the time, and I just wanted to get on and share some of those thoughts. Feel free, I would love to hear your response in the comments. Do you feel like I was off on anything? Do I need to clarify anything? Love to hear your thoughts, and we can continue the conversation there. And just praying for you today. Let me actually take a second. Let's close in prayer, and just for you, and for all of us, that we'll seek God in these things. Father, thank you so much for each teacher, and just that they're even taking the time to listen to this. I pray that you will give them strength in this crazy month of May, and I pray that you will give us all wisdom. Help us to know your truth. Help us to know the Bible, to know, just to know your truth and to remember your truth, and just to reject the wrong thinkings that are around us and just try to overcome us. I pray that you will keep us in your truth, that you will guide our words and our actions and our deeds, that we will bring glory to you, and that if in your plan you choose to use us to reach into others' hearts, I pray that you will just give us wisdom and that you will make it clear what you would have us to do. In Jesus' name we pray, Amen. Thanks, and have a great day, and enjoy your weekend. Linda, Awesome response! The Word is always where we should go first. You shared with grace and truth but especially not compromising the truth! Thanks so much for addressing these timely topics, Linda. You did it with grace and truth and reminded me of some important points. Linda, You did a beautiful job in discussing this issue! Thank you for sharing. Thank you, Linda for speaking the truth boldly with love! We all need to be reminded that Jesus who said of Himself, “I am the way, and the truth, and the life; no one comes to the Father except through Me” loved and prayed for all those around Him. We need to hold to the truth He spoke and then love like He did. I believe you were spot on. I can only imagine our Lord being proud one of His own not comprising His Word. Thank you so much for your insight and support. Linda, I love this. You clearly explained some issues that are easily muddled in our world. Thank you for sharing the truth with grace. Linda, I appreciate your willingness to address controversial topics such as this particular one. I believe the Lord has given you a wonderful ministry and opportunities to share God’s Truth through Teach 4 the Heart. Thank you for your courage and your concern. You did an excellent job explaining how to approach people with God’s Truth in a loving and kind manner.